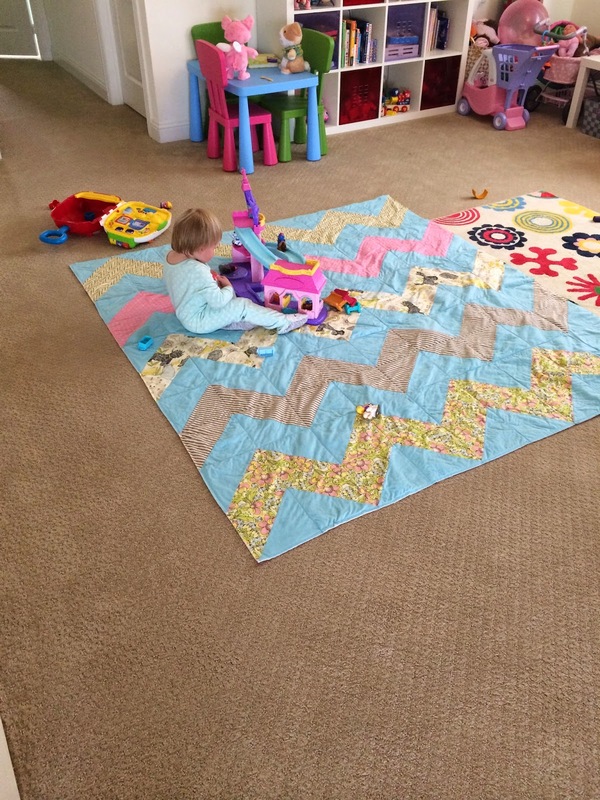 Since I took up sewing as a hobby a few years ago, I have made multiple modest baby blanket quilt tops and even a queen size t-shirt quilt/blanket. However, I had not actually "quilted" through any of these. 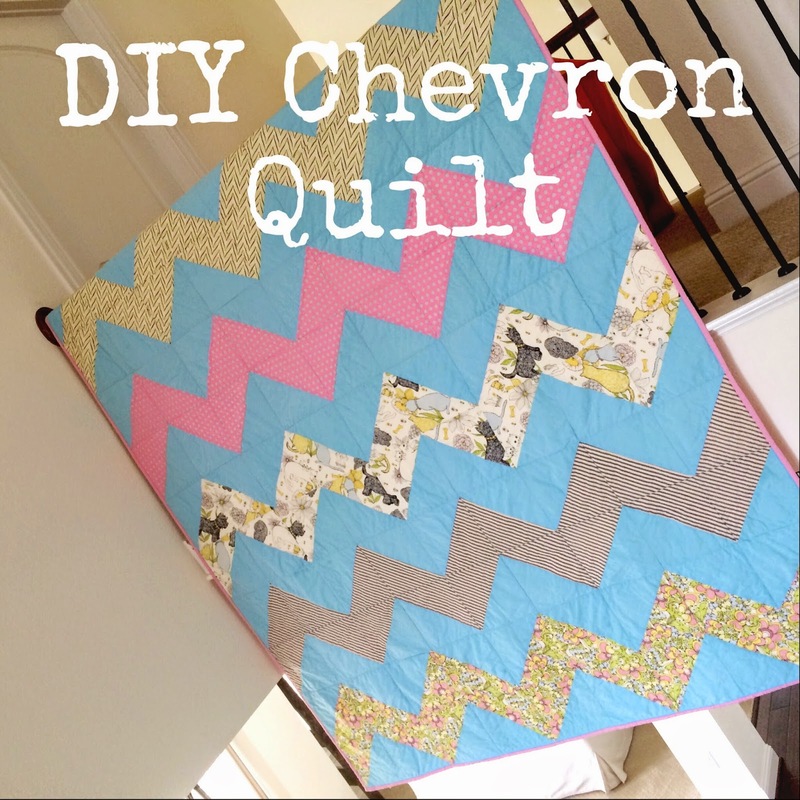 Until about 6 months ago, I never planned to quilt anything... that was until I saw this tutorial for a Chevron Quilt (the easy way...) posted on Scattered Thoughts of a Crafty Mom. 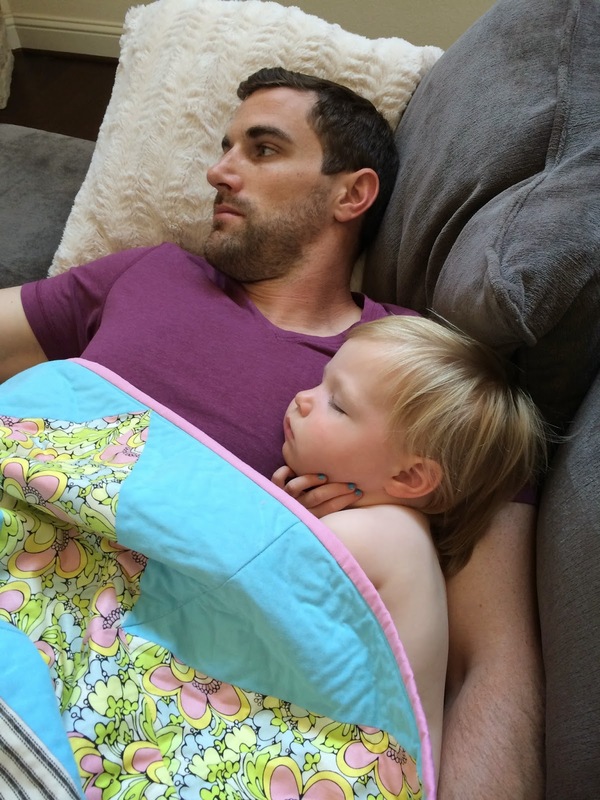 I wanted this...no needed this quilt for Ryann! First stop, Etsy! Needless to say, I was less than impressed with the selection (and price). So I talked myself into doing it myself. The original inspiration post said it was "easy", right? First stop, Hobby Lobby. Ryann and I hit up our local store in search of fabric. Ryann of course wanted "meow, meow" fabric so we settled on a playful print featuring puppies and kitties as wells as other coordinating fabrics. Cutting and sewing the half square triangles was not that bad. The pressing, on the other hand, is a whole other story. 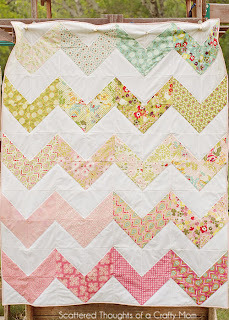 I loathe ironing and there was a lot of time spend on this quilt doing just that. 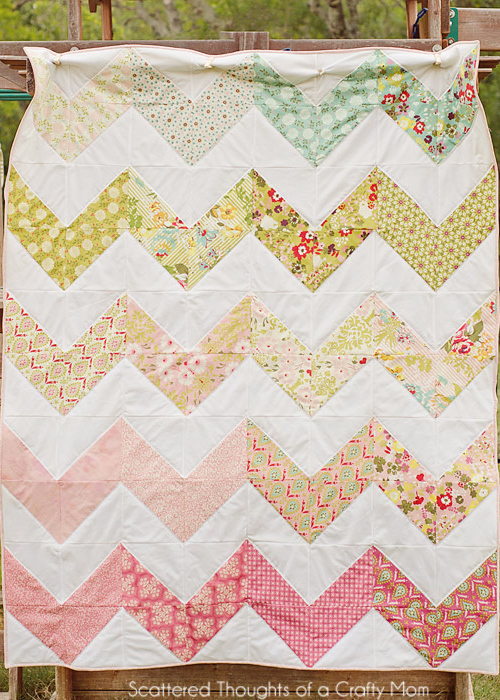 As per the above tutorial, piecing together the quilt was cake and then it was just a matter of sewing the squares together. This is where my quilt hit a pretty big stall. 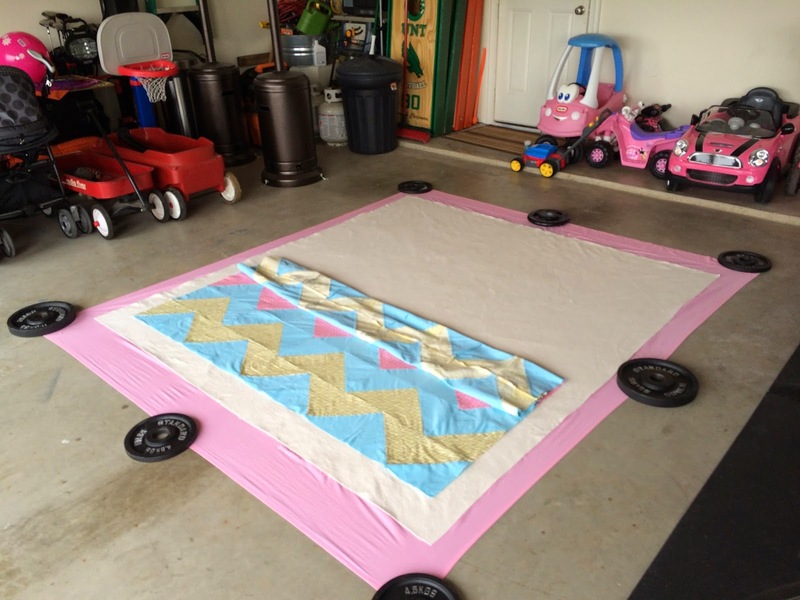 I was scared to death to try and baste/bind my quilt. I considered sending it off to have someone else quilt it. However, after about a month of letting it sit, I finally got up the courage and made it happen. 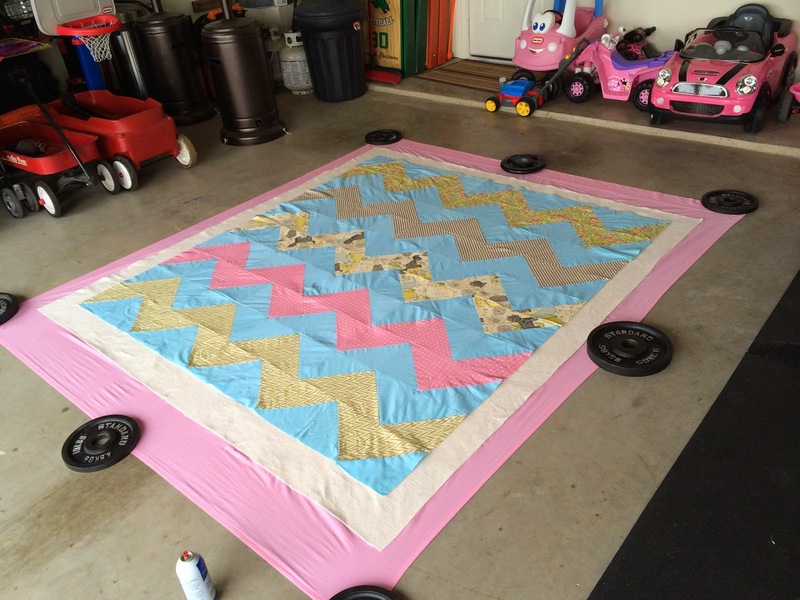 I scoured the internet for binding tutorials and opted to use adhesive spray to baste the quilt. Thank goodness it was still cool outside because this was a workout! 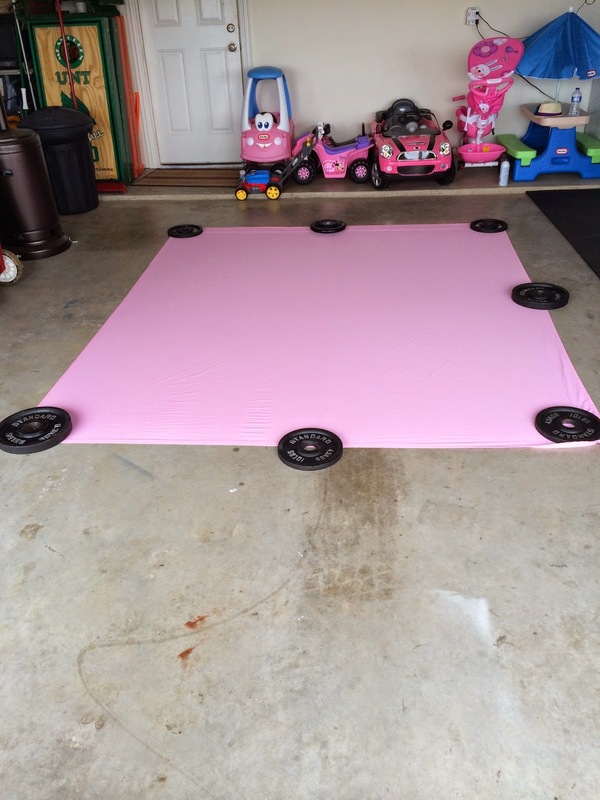 The directions on the adhesive spray recommend use outside so I utilized our garage floor. 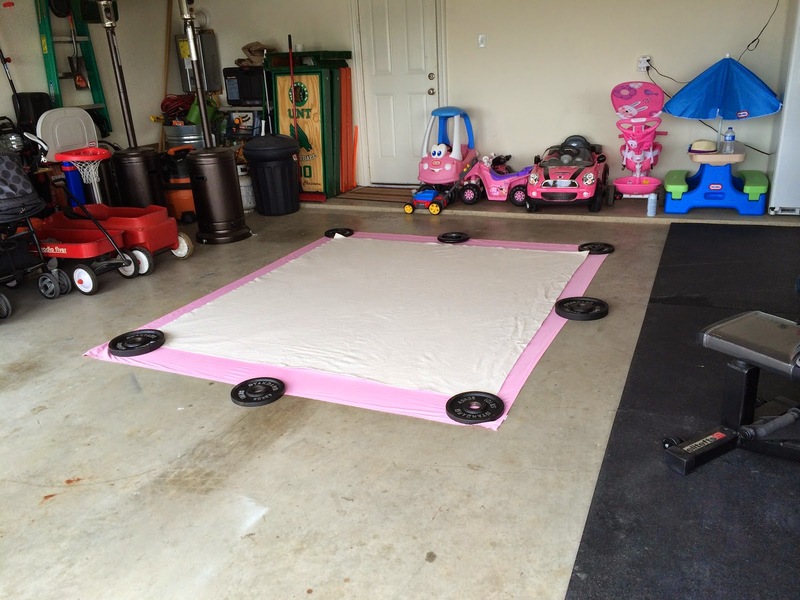 Thank goodness for all of my husbands weights! They worked perfectly to hold down the layers. 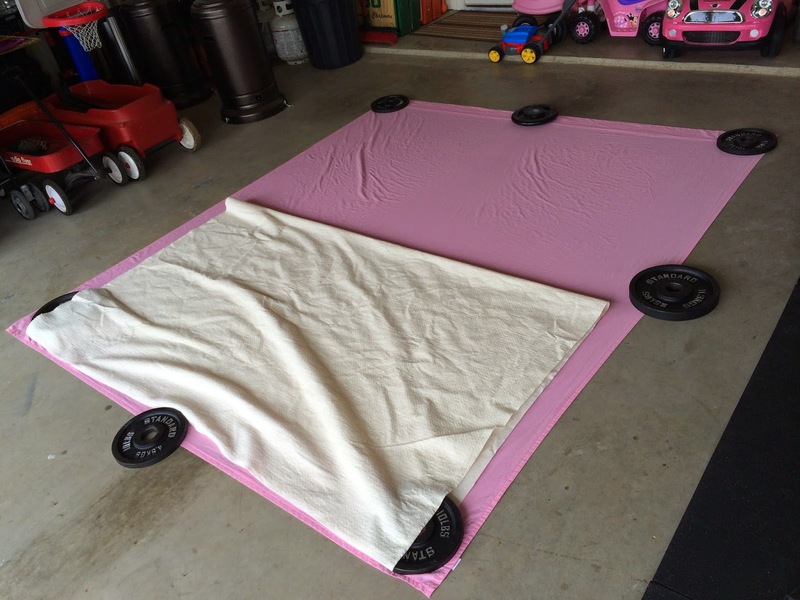 For the quilt backing, I used a queen-sized flat sheet from Walmart. If you go this route, make sure you select a sheet with a relatively low thread count so that your machine does not skip stiches. Once it was all basted, I trimmed off the extra fabric and batting. I also checked to make sure the edges were at 90 degree angles. Commence dramatic music... then I started to "quilt". I sewed around the outside first to keep everything secure and then moved on to the straight seams working form the middle out. 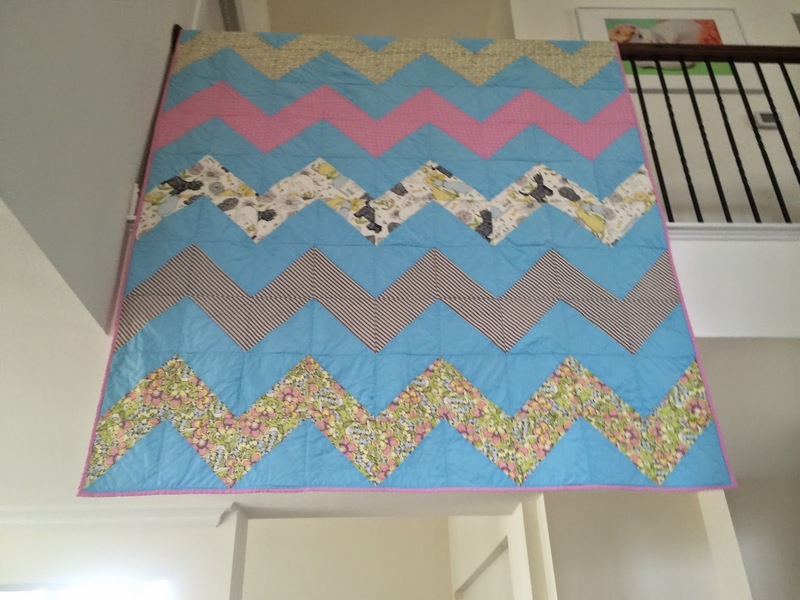 I had originally planned to quilt through the chevron zigzags but had yet to screw it up and decided to stop at with the perpendicular stitches. At this point I was pretty impressed with myself! Last step, binding. I went ahead and purchased a twin-sized sheet from Walmart in the same color as the backing to use as binding. I followed this tutorial here to create the binding. However, I machine sewed the binding instead of hand stitching.